Tarek is Strategic Planner/Digital Director at JWT in Dubai. His chief role is the development of strategic engagement for Nestlé, Audi and BMG in the Middle East region. 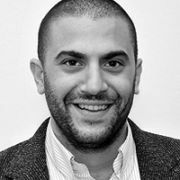 Prior to this appointment, Tarek worked as an Account Director for Mindshare in London, where his key responsibility was the digital strategic planning and buying across Ford PAG Group, Midway Games and BP in the UK.